This allows you to drill down into each customer touch point and quantify its ability to generate or destroy customer loyalty. As a bonus, if you run the process in the right way, you can generate a service recovery notification for sub-standard customer experiences. This allows you to run a service recovery process and, hopefully, become the proud recipient of increased customer loyalty though the service recovery paradox. But is the service recovery paradox real? 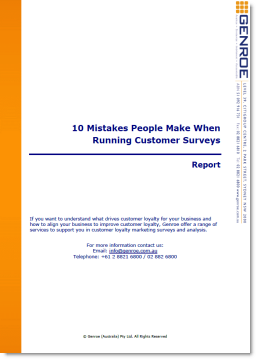 Do customers who have had an issue resolved really generate more loyalty than those that have never had an issue? Luckily we have the help of academia to answer that question: yes indeed the service recovery paradox is real but it does not work equally well in every situation. Magnini et. al. in their paper “The service recovery paradox: justifiable theory or smoldering myth?” set out to determine if, when and how the service recovery paradox operates. Their findings are instructive not just on how to leverage this idea but also in reminding us that it is not a saviour for bad service. This is logical, if the organisation has repeated service failures then the customer will not be satisfied with repeated service recoveries. The implications of this are clear. Service recovery processes are special event responses and should not be relied upon to deliver good service. If a customer misses a major personal event due to a delayed flight no amount of discounted flight coupons is going to raise their level of satisfaction. Long term customers who experience a service recovery will have their loyalty improved about the same amount as new customers. Where a customer can see, or you can show them, that the issue was beyond your control, a service recovery process has a better chance of improving customer loyalty. So if you can provide a third party explanation of the failure you may be better off. Take for example delayed flights by airlines. Saying, as airlines seem to do all the time these days, “this flight is late because it was late departing” is less likely to invoke the service recovery paradox than saying “this flight is late because of bad weather”. The implication here is that staff should be taught to manage customer expectations when the service issue is truly beyond company control. If your local supermarket doesn’t have enough checkout aisles open late Sunday afternoon, when everyone does their last minute shopping for the week ahead, customers are less likely to be wowed by your service recovery. It seems to me that all of these findings are consistent and lead to a clear view of service recovery. Long term you need to work on your customer experience management processes to ensure that you deliver consistent and reliable service to your customers. If occasionally you do make a mistake, customers will forgive you, subject to the areas noted above, and proactive service recovery will lift customer loyalty. However, do not rely on service recovery processes as your service processes. Thanks for spotting that — the original link has been taken down and unfortunately I can’t find another unrestricted version. So I have linked to a research portal, which unfortunately, charges for access.